I know…. librarians are supposed to get excited about Melvil Dewey, the American educator and inventor of the Dewey Decimal system of library classification. No disrepect to Melvil, but I am more intrigued these days with the other Dewey …. John. 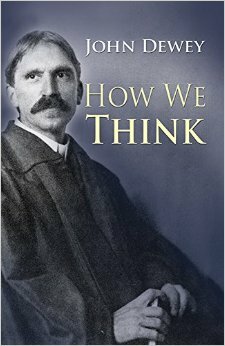 On November 27th at History Libraries and Research Open Day at Senate House Library, Nazlin Bhimani and I will be celebrating the work of John Dewey as well as other American educators. Thinking begins in what may fairly enough be called a forked-road situation, a situation which is ambiguous, which presents a dilemma, which proposes alternatives …. In the suspense of uncertainty, we metaphorically climb a tree: we try to find some standpoint from which we may survey additional facts and, getting a more commanding view of the situation, may decide how the facts stand related to one another ( 1910, p.11). I may be taking Dewey out of context, but I’d like to apply his metaphor about climbing a tree to get a better view to what happens when students are confronted with a forest of information when they are searching. Too often, I see students bewildered and confused about the different pathways to information. This image of a learner climbing a tree, getting a lay of the land, possibly a breather, comparing and making clearer choices about sources, is advice we could all follow. Thanks, Dewey. The next time a library user encounters a ‘forked-road situation’, I’ll advise him/her to metaphorically climb a tree. This entry was posted in History of Education, Library and Archives, Special Collections and tagged 20th Century Pedagogy, American education, Education Philosophy, Education Theory. Bookmark the permalink.